Antichamber is a fun puzzle game with similarities to Portal but isn’t as polished. I picked up Antichamber during a Steam sale a while back but never got around to playing it until recently. Featuring a mute protagonist wandering through a series of puzzles by using a “gun” that changes the world instead of shooting bullets and only works on certain surfaces, the resemblance to Portal is unmistakable: Antichamber’s use of different primary colors to signify a material’s unique qualities also evokes Portal II’s paints. However, Antichamber does distinguish itself from Portal by using non-euclidian geometries to give the game a strong focus on changing perspectives and seemingly impossible geometries (which reminded me of games like The Stanley Parable (without that game’s satire or narration) and even games like Prey). Unfortunately, while Antichamber is quite fun, has a unique aesthetic, and has some quite imaginative puzzles, it is also sometimes frustrating and non-intuitive. One of the reasons for this is that, unlike the other games, it is fairly non-linear and doesn’t have a strong narrative. 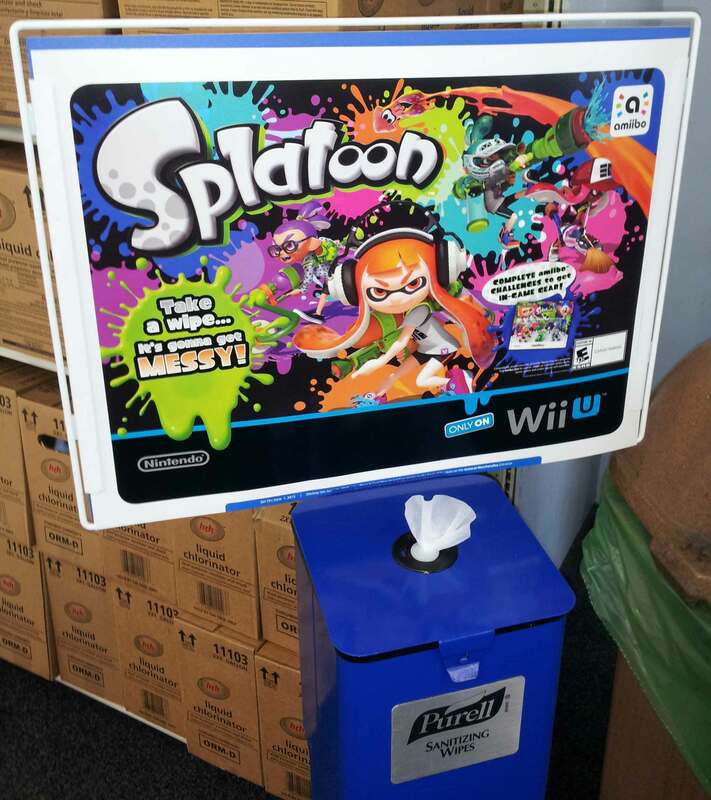 This means that once you unlock puzzles you can play them in any order you want. This allows you to go back and take, say, the door on the left instead of the door of the right. However, this means you can become confused as to which puzzles you have beat and which you haven’t. Worse than being lost is the fact that throughout the game you gain new “guns” which give you new abilities but there is no way to tell if a puzzle requires a gun you don’t have yet. This means I spent lots of time trying to solve a solution to a puzzle, becoming frustrated, looking up the room on the wiki, and founding out that the puzzle required a gun I didn’t have yet. Maybe it is a personal failing but I have very little patience for puzzles when I don’t know if it is even possible for me to solve them. I want to know if I am trying the right thing before I spend 20 minutes doing the same thing over and over. Even when I had the correct gun, the answers to puzzles weren’t always intuitive or clear. More than once I would rub against the walls and jump around trying to find a fake wall or a barrier that would disappear if I went through it in midair. There were even times when I had watched the walkthrough videos on the wiki and still had a difficult time progressing (to the game’s credit, however, this could be because puzzles could be solved in multiple ways and I might have been trying the wrong solution for he gun I had at the time). That said, there really is a feeling of triumph when you figure out a puzzle and the playing with perspective to move a character from one place to another is quite fun. Combined they give a feeling of discovery that is quite engaging. It is just too bad that it frequently felt like trial and error instead of discovery. While writing this, I found that the creator did a post-mortem for the game and GDC has it up in two parts. I haven’t watched it yet but it sounds interesting. This War of Mine is a fascinating game. It is a side-view game that shows you a cut-away dollshouse-style view of the building you are in. You control a small group of survivors (up to 4, I think) who are civilians trying to survive a war in an Eastern European city. One character at a time you give characters orders like open a door, cook food, go to sleep, or build a shovel. There are two parts of the game: day and night. During the day you control the players and tell them to eat, build things or raise vegetables. Occasionally someone will come to the door to trade, ask for help, or even ask to join your group. 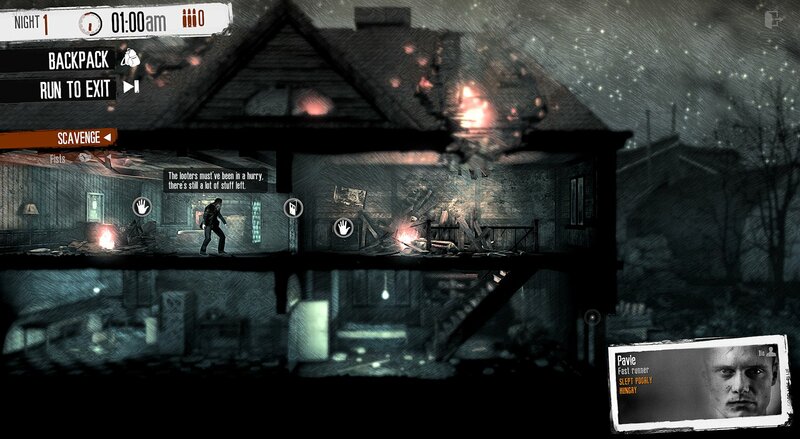 During the night you pick one person who goes out to into another building in the city where you scavenge for food and supplies and encounter other groups of survivors who may be hostile, willing to trade, or just want to be left alone. While one of your characters is out for the night, your home can be raided and the others can be hurt so you should leave someone on guard. Managing the physical and emotional health is a huge part of the game. Characters can be hungry, tired, hurt, sick, or depressed. Most, if not all, of these can end in the death of a character. 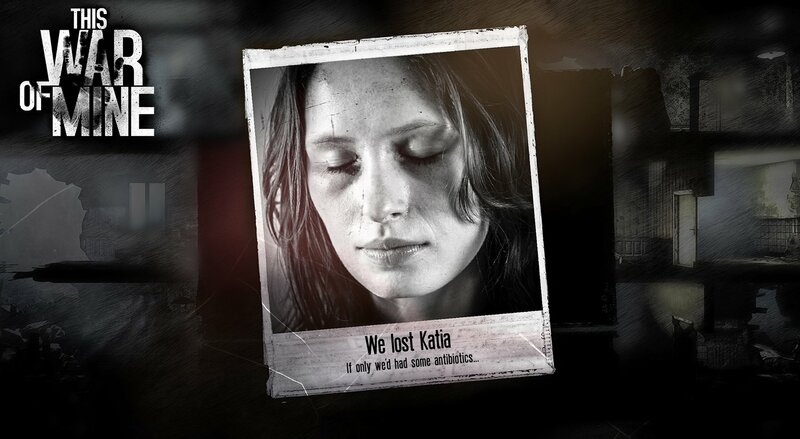 When a character dies it is touching because it is (usually) not a death from combat, as in so many other games (although characters can die in combat while scavenging) but from hunger or illness. This makes it sadder because it is such a mundane death. When one of my characters in the game gets shot to death, I am frustrated but when one dies from hunger, I am disturbed. You can keep playing with fewer characters but, to be honest, I usually quit and start over. In this way, despite the “realism” of the situation I still treat it like a game. The creators of the game try to eliminate that gameness by autosaving and lot allowing you to go back to earlier saves but this just serves to make dying more frustrating and makes me play more conservatively. The game creators might say that is the point but it is a balancing act that I’m not sure is solvable. There are some issues with the interface that I would like to see ironed out. If nothing is happening during the day, there is a button to end the day and send someone out scavenging but there are times when you are waiting for something like a water filter to work where you don’t want to end the day. In those cases, you have to just sit there and wait when it would be nice to be able to jump head a couple hours. Another issue is that when you go scavenging it is too easy to send the person to a place without equipment or to have the people staying behind sleep on the floor instead of a bed (which means they will be complaining the next day). There are minor complaints though and don’t really detract from the game. Blake J. Harris’ tale of the rise and fall of Sega is both incredibly fascinating and incredibly frustrating. It is incredibly fascinating because it gives lots of details on how Sega America was able to make the Genesis as popular but unable to capitalize on that success in the long term. Personally, I didn’t find the dialog particularly bad. I just want to know what people actually said. I wish Harris had just released all the interviews or at the very least had included tons of footnotes (Not endnotes though. Endnotes are evil! (And the Endnote application is even worse!)). Of course releasing the interviews probably wouldn’t have sold as well or gotten optioned for a movie but it would have satisfied me and isn’t that really what is important? Moving from criticism of the style to discussion of the content, Harris makes a convincing case that the real war wasn’t between Sega and Nintendo so much as it was between Sega of Japan and Sega of America. While the style of the book makes it hard to tell if this is entirely accurate or is jingoism, it is an interesting tale with lots of things that I wasn’t really familiar with as well as a great deal of stuff that I remember seeing as a college student in the early 1990s. This combination of things I didn’t know anything about and things that I kind of remembered happening made reading the book an interesting experience. Because I was reading it on my Android tablet, I actually spent a lot of time switching back and forth between the book and a web browser looking things up in the attempt to find out more about the people and events. Since finishing Console Wars I have started reading another non-fiction book and find that I am doing the same thing with it. I wonder if the mid-1990s notion of hypertext has been replaced by the ability to just jump from the book to an online text at any point? I found this particularly weird in the other book I have read when it mentioned someone early on and I went online to read a couple articles about that person. Then later in the book when there was a chapter devoted to him I had a hard time deciding if I had already read that chapter or not. However, that says more about me and my attention span than it does about Console Wars. To get back on topic, despite its flaws, Console Wars is really a must read for anyone interested in the history of Sega and Nintendo in the USA in1990s. The specificity of that recommendation is meant to indicate some of the other flaws of the book because Console Wars doesn’t spend much time discussing what Sega and Nintendo were doing in Europe and only really discusses Japan in comparison to the USA, barely mentions other consoles that were out around that time, and really tapers off before and after the 1990s. Keeping those caveats in mind, Console Wars is really worth reading if you care about the subject mater at all. I like listening to podcasts in my car, when I’m riding my bike, and walking around campus. So I’m always looking for new ones to listen to. One of my favorite places to look has been a thread on the Idle Thumbs forums which is where I ran across a post about the Spawn on Me podcast. On it they talk about videogames and identity. It has quickly became one of my favorites (except when they talk about sportsball… 😛 ) and often gives me something to think about. The most last episode I listened to was no exception (I’m a little behind as they have released a new one since then). Titled “Blackademics 101,” the episode features guest co-host Tanya Depass, and guests Kishonna Gray and TreaAndrea Russworm talked a lot about not only race in games but also in academia. On the episode they talked about getting pushback from students when they talk about race in the classroom and how they have gotten comments about it from students on their course evaluations. This resonated with me because I talk about race in my classes but I haven’t gotten much pushback from students and I haven’t had any mention of it on my course evals. However, when Gray and Russworm talked about some of the harassment they have gotten online it reminded me of the very minor incident I received a year or so ago and my reactions to it. It happened when someone started found the abstract to my dissertation and posted it in an online discussion thread I had been taking part in. They started trashing it and making assertions. I was worried they were going to start dogpiling me and hunting down personal information. Luckily, none of that happened and in a few hours the thread had died down and nothing has come of it. But in the moment I was worried. I contemplated deleting my accounts and posts or denying that it was me. But I didn’t want to do those because I was worried they would think it was a sign of weakness. Instead, I just closed the browser tab and went away for a few hours and it went away. No harm done. What I experienced was minuscule and was over in a few hours. I can’t imagine what it is like to be the center of attention like that for days or weeks or months at a time. The urge to bury your head in the sand and never say anything ever again must be very strong. (Even as a write this I’m trying to be both vague as well as non-accusatory so that this very post doesn’t get any negative attention) But they and others who have been the subject of much harsher and sustained scrutiny haven’t buried their heads and that takes bravery. Being a latecomer to the PS3, I hadn’t ever played the Prototype games so I didn’t know what to expect from Prototype 2. Overall the game has a lot of nice touches and is pretty fun even though it lacks mission variety. The main thing to like about Prototype 2 is the ability to run around a city and beating up bad guys (and civilians if you want) at random. To encourage you to just wander around the game has some collectables and mini-missions hidden around the city that can give you powerups when completed. One of the nice touches is that instead of making you wander around aimlessly looking for collectable 5 out of 5, if you pull up the in-game map you can see possible locations for the collectables and mini-missions which help you locate them. But because it only shows you some possible locations in the form of radar pings you still have to hunt around a little but you have some idea where to look so it isn’t totally aimless. While playing the game I really wished someone would make a cyberpunk-GTA clone. I guess Watch Dogs was supposed to be that but I haven’t played it and it got terrible reviews. But the ability to wander around hacking into things randomly seems appealing. Also unfortunate is the fact that the game only has a few basic mission types: find the monster and fight it, sneak into somewhere to kill someone then fight the monsters, timed item collection, and protect the bad guy until he can lead you to something you want. The game tries to switch it up by making you wonder who to trust and things like that but this mostly happens in non-interactive cutscenes which makes me kind of uninterested and at least partially ignore them. While playing Prototype 2 I enjoyed it but looking online it seems like there isn’t any talk of a third one which is disappointing since it was fun and I would like to see what they could improve on in a sequel. However, since the studio that made the games got shut down because of poor sales it seems unlikely that Prototype 3 will be coming any time soon. Legendary is a pretty generic FPS game with some odd things in its design that really make it hard to enjoy. First of all, even for a game released in 2008 it looks really dated. Wikipedia claims it uses the Unreal 3 engine but it really doesn’t look like it. Now Gears of War probably had a much bigger team and the difference isn’t all that large but it is noticeable. I also post this video to point out a design choice the Legendary team made that is really hard to understand. That Legendary video is the second part of the walkthrough after you watch an obligatory intro movie that sets up the premise and the game is still telling you things like “hold left shift to sprint.” Now the thing is that the game isn’t just holding your hand for a long time and it tells you that all the time. Instead, you can’t run or jump until the game decides to introduce the mechanic to you. In the first couple minutes of the game there was something in the way that I wanted to jump over but hitting the space bar didn’t do anything. So I assumed that you couldn’t jump in the game. Then just a couple minutes later the game decides to allow you to start jumping. You can jump from then on but why in the world would you disable the ability to jump for the first few minutes of the game? It isn’t like there are any cliffs you can fall over or something. It is just ponderous. Another weird design choice is that early in the game pretty much the only monsters are these lava creatures. It gets really monotonous. Then they switch to something else and they never use that monster again. That just seems weird. There’s no reason why they would confine the lava creatures to just one part of the game or that they wouldn’t mix it up more. They just don’t. There are some boss battles which are pretty standard and a partner who is largely on the radio (like SiN and a million other games). Then the end is basically incredibly anticlimactic. I played the first Assassin’s Creed back when it came out and liked it well enough. I just never got around to buying the others. A couple months ago there was a sale on steam and I picked up Assassin’s Creed II, Brotherhood, and Revelations. I’m playing through 2 and I’m enjoying it but drm is still terrible and it is a bad port. Although the game is on Steam, it still uses the crappy Uplay drm which requires it to launch the Uplay program thingy. Only it won’t launch on Windows 8 when you try to start it through Steam. OK, fine. I can just launch it directly through the Uplay thing, right? Of course not. When you try to do that it says it is launching steam or something but that doesn’t work either. So play the game I bought, I have to launch Steam, then launch the Uplay application which I had to enable running as administrator, then go back to Steam and start the game, which makes the Uplay thing flash in the taskbar so before the game starts I have to click on Uplay to give it focus and then the game will start. So once I get the games started it runs fine. Only, instead of telling you to press the left mouse button or the E key or whatever, it shows you a picture of an open hand, or a closed hand, or a foot, or something else. And the background of the icons clearly have the Xbox button colors which probably indicate which controller button you need to press. 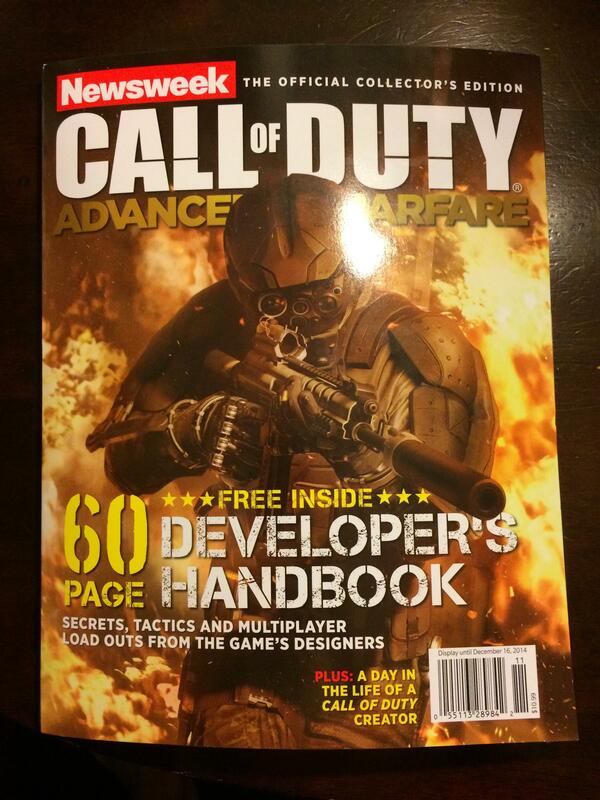 A Call of Duty edition of Newsweek? While there have been special issues of magazines for specific videogames before and whenever someone famous dies it seems like there are special “tribute to X Collector’s Edition” magazines on the stands just days later, it seems weird that Newsweek would be the one to have their name attached to this. Of course, because I love gaming magazines I had to buy it, so I guess the combination worked.